Fans of Maggie Barbieri’s Murder 101 series have come to expect impeccably crafted mysteries with an added emphasis on humor and romance. When those readers come to Once Upon a Lie, the first in her new series, they may experience a bit of a shock. Barbieri has taken a darker turn with her first thriller, but readers will quickly realize that they are still in capable hands. Once Upon a Lie is the story of Maeve Conlon, a divorced mother and bakery owner, who finds herself struggling to prove her father’s innocence. When her cousin Sean is found murdered, it isn’t long before the police begin to focus their attention on Maeve’s father, Jack. It would seem that providing a simple alibi would clear Jack’s name, except for the added complication of his medical history. You see, Jack has been living in an assisted-living facility and is slowly succumbing to the dementia associated with Alzheimer’s. While the staff at Buena del Sol can confirm that on the night in question, Jack left the complex without signing out, no one seems to know where exactly he went – least of all Jack himself. Convinced that her father would never have committed such a crime, Maeve takes it upon herself to prove just that and maybe uncover the real culprit in the process. The only problem is that the Conlon family has not had the best relationship with Sean over the years. Maeve herself has been harboring some dark secrets about her childhood and the police are very close to uncovering this history. Readers should rest assured that there is more to this story than these dark underpinnings. Barbieri continues her tradition of filling the background with quirky characters and humorous situations. When Maeve accidentally takes an order for a Batman cake (instead of a Baptism cake), the reader’s smile will bring light to the darkest corners. Maeve’s best friend and business partner Jo also brings comic relief in her role as sidekick. When she “forces” Maeve to attend a speed dating event with her, readers know that this won’t end well. Their long-standing friendship is depicted in the most honest of ways. Through good times and bad, these two remain loyal to each other, but like all relationships, it is always a work in progress. The decidedly contemporary attitude and vibe of the novel are a refreshing change of pace for the thriller genre, but the twists and turns are still vintage material. Maggie Barbieri is not afraid to confront the harshest of topics but does so in a compassionate manner and in creating Maeve Conlon, she has created a character that readers will long to see again. 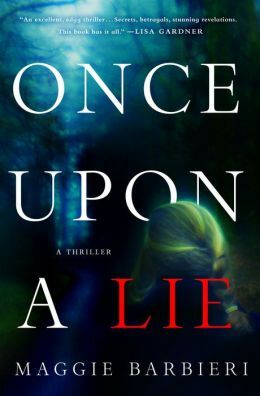 Once Upon a Lie allows Maggie Barbieri to push aside the curtains of ordinary life to show readers that sometimes the true villains are closer than anyone would like to believe. No doubt, some readers will quibble about the ending of this thriller, but few will have a harsh word to say about the method by which the author got them there.